Cavalier King Charles Spaniel Characteristics: The outgoing and companionable Cavalier King Charles Spaniel is a breed of small dog classified as a member of the Toy Dog Group (AKC:1995). The Cavalier King Charles Spaniel, is characterized by its graceful appearance with a flat head and gentle, appealing expression. Other characteristics include big, dark, well spaced round eyes; long, high set, pendulous ears; an energetic tail and an elegant, fluid gait. The temperament of the Cavalier King Charles Spaniel can be described as Social, Courageous, Affectionate. The coat type of the Cavalier King Charles Spaniel is described as medium, soft coat in assorted colors. Due to its characteristics and qualities, the Cavalier King Charles Spaniel demonstrated the desired traits of a Bird Flusher and lapdog and is known by its nick name the "Merry Monarch's Dog". The origin of the Cavalier King Charles Spaniel dog breed was in United Kingdom where it was developed in the 1600's. Cavalier King Charles Spaniel Breed Group and Dog Type - Toy Dog Group (AKC:1995): The Cavalier King Charles Spaniel is one of the many breeds of dogs that belong to the Toy Dog Group (AKC:1995). Origin of the name: The name "Cavalier King Charles Spaniel" derives from England in the 1600's when the Stuart royal family, including King Charles I and King Charles II led their supporters, called Cavaliers, against the Roundheads led by Oliver Cromwell. The name 'spaniel' originated in Spain and referred to a surname meaning "Spaniard". Cavalier King Charles Spaniel History and Origin: The country of origin of the Cavalier King Charles Spaniel breed was in United Kingdom during the 1600's. The Cavalier King Charles Spaniel is a relative of the English Toy Spaniel and has inherited its big, dark eyes, appealing expression and a lively, constantly wagging tail. The English Toy Spaniels have longer, pointed muzzles and thinner-boned limbs than the Cavalier King Charles Spaniel, which was cross bred with the Pug. General John Churchill, 1st Duke of Marlborough (1650 – 1722) developed the breed at Blenheim Palace. General John Churchill served the Stuart royal dynasty and his dogs were extremely popular with the Stuart Royal household. Their popularity at court was due to a previous decree made by King Henry VIII (1491 – 1547) that no dogs were allowed at Court except for "some small spanyells for the ladies". King Charles II (1630 – 1685), nicknamed the "Merry Monarch" ascended the British throne in 1660 during the Restoration period, following the English Civil War between the Cavaliers and the Roundheads. King Charles II was closely associated with the breed and it was said that "His Majesty was seldom seen without his little dogs." In 1945 the UK Kennel Club recognised the Cavalier breed in its own right as the Cavalier King Charles Spaniel, named in honor of King Charles II. Cavalier King Charles Spaniel Modern History: The modern history of the Cavalier King Charles Spaniel moved on and the breed is now a perfect family pet and companion. The Cavalier King Charles Spaniel was officially recognized by the American Kennel Club (AKC) in 1995. Cavalier King Charles Spaniel Height: The Cavalier King Charles Spaniel breed is classified as a small sized dog. The height to the shoulder of a male dog is 12-13 inches (30-33 cm). The height to the shoulder of a female Cavalier dog is Slightly Less. Cavalier King Charles Spaniel Weight: The weight of this small sized dog, in a male dog is 10-18 pounds (5-8 kg). The weight of the smaller female dog is slightly less than the male. 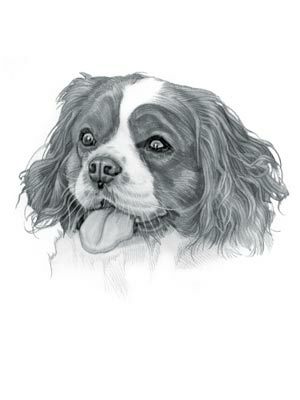 Cavalier King Charles Spaniel Coat Type: The Cavalier coat type is described as medium, soft coat. Cavalier King Charles Spaniel Coat Colors: The Cavalier King Charles spaniel can be found in one of four colors: Blenheim, tricolor, ruby, and black and tan. N.B. The term 'Blenheim' refers to the red and white colors of the Blenheim Spaniel that was developed at Blenheim Palace, the seat of the Duke of Marlborough, England. The term "Red" refers to reddish shades of orange, brown, and tan colors. Cavalier King Charles Spaniel Grooming - HIGH Grooming Needs: The grooming needs of the Cavalier King Charles Spaniel are categorized as high in order to maintain a healthy coat and reduce the risk of skin infections. The high grooming needs of the Cavalier King Charles Spaniel is considered to be high-maintenance and requires almost daily brushing and combing. Grooming Requirements should include bathing the dog on a monthly basis and making regular inspections of the nails, teeth, eyes and ears. Cavalier King Charles Spaniel Litter Size: The litter size of the Cavalier dog breed ranges from 3-5 puppies. Cavalier King Charles Spaniel puppies for sale can be obtained reputable breeders and from rescue centers. The cost of Cavalier King Charles Spaniel puppies varies depending on location, pedigree history and the dog breeder. Cavalier King Charles Spaniel Temperament and personality: The temperament and personality of the popular Cavalier King Charles Spaniel dog breed is described as Outgoing, Social, Courageous, Affectionate and Companionable. Cavalier King Charles Spaniel Exercise Requirements - MINIMAL: The exercise requirements of this breed of dog is minimal. The Cavalier King Charles Spaniel requires regular daily exercise consisting of approximately 30 minutes every day. This small dog has an elegant, fluid gait with small strides and only requires a fairly slow speed by the owner to meet the dogs exercise requirements. Remember that it would take a lot of extra steps by your dog to keep up with your normal walking pace. Cavalier King Charles Spaniel Diet: A fully grown Cavalier King Charles Spaniel should be fed twice a day. A diet consisting of a premium dog food can be balanced with fresh food eaten by the family. The question is What Can Dogs Eat?. Check out our comprehensive list of what dogs can and what dogs cannot eat. Cavalier King Charles Spaniel Health Problems: Potential health problems of the Cavalier King Charles Spaniel breed include Ear infections, Eye problems, Patellar Luxation . Resolving health problems can prove to be expensive and it is always wise to obtain pet insurance or dog health insurance when buying a dog. Is the Cavalier King Charles Spaniel dog breed said to be Hypoallergenic? Answer: No. Cavalier King Charles Spaniel Lifespan: The life expectancy of dogs vary according to the size, breed of dog and any serious health problems. The typical lifespan of the Cavalier King Charles Spaniel breed is 10-14 years. Cavalier King Charles Spaniel Male Dog Names: Male Dog names are most often chosen to reflect favorite names of the owner or the strength, size, coloring and country of origin of the Cavalier King Charles Spaniel breed. To give you some inspiration regarding good male Cavalier King Charles Spaniel names our small selection might be of help with naming boy dogs. Our top male dog names are: Little Boy *** Puddles *** Charlie *** Rocky *** Foxy *** Bugsy *** Riley *** Oscar *** Winston *** Rascal *** Button. Cavalier King Charles Spaniel Female Dog Names: Female Dog names tend to be softer, prettier and reflect the temperament of the Cavalier King Charles Spaniel girl dog. Our top choice of good female Cavalier King Charles Spaniel names are Maggie *** Daisy *** Queenie *** Tinks *** Pixie *** Lucy *** Hiccup *** Tootsie *** Romy *** Sadie *** Coco.